The title of Santa Fe based artist Joyce Melander-Dayton’s current outing at the June Kelly Gallery, through March 29, in New York City reads Extravagant Constructions. 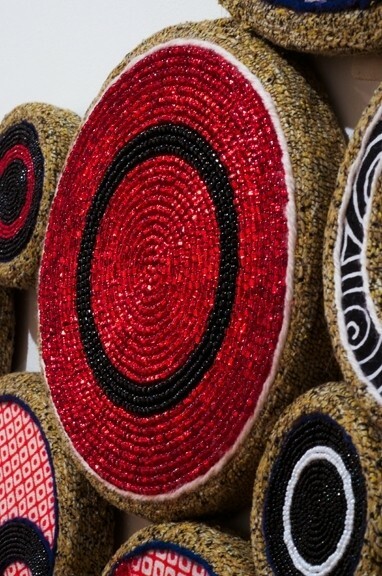 It’s an apt title, especially when you are standing up close and studying the artist’s intricately bejeweled craftsmanship and her use of materials and patterning. Think Faberge Egg or the Gobelin Tapestries. It could just as easily have been labeled, depending on where you are standing in relation to her work, where your brain is at the moment, and how well you know the artist’s past history, Musical Meditations, Celestial Compositions, or How I Keep My Life Together. For the exhibition is all of this and more, the more being, quietly beautiful in the extreme, and very much alive. Slow and steady, followed by a small, but nonetheless, near cataclysmic change in the direction of her work seems to be Melander-Dayton’s modus operandi. 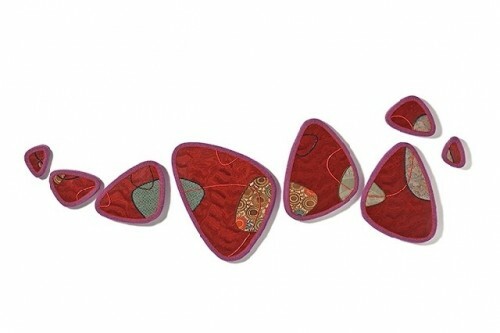 At her three 2007 exhibitions at Aaron Payne Fine Arts in Santa Fe, Gallery Shoal Creek in Austin, and the June Kelly Gallery, the artist, primarily known for her figurative work, fully embraced the abstract by presenting her collaged, fabric and fiber-based ornamental elements on linen. At last year’s mid-career retrospective at the Rymer Gallery in Nashville, Tennessee, it was the artist’s free standing abstract sculptures that put in an unexpected appearance. 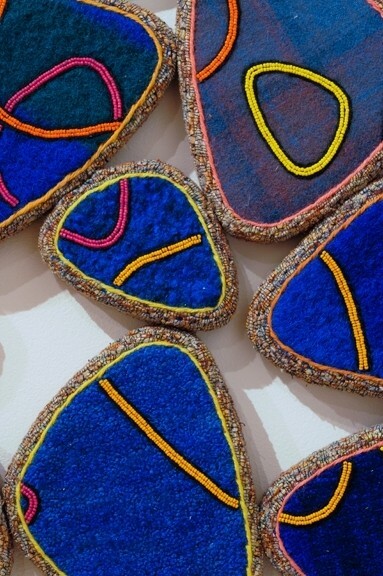 This past summer, in yet another ‘new works’ exhibition at Aaron Payne, her home town gallery, it was Melander-Dayton’s, three dimensional wall hangings, composed of exotic wood veneers, wool, silk fabrics, and glass beads that took us by surprise. Extravagant Constructions, yet another of the artist’s leap into uncharted territory, is Melander-Dayton’s most elegantly curated and spiritually resonant showing to date. It is hard to imagine – nonetheless, this is what transpires – that each of the eight works on view tackle so many ideas with such otherworldly elegance. The only possible explanation, other than acknowledging the visionary aspects of New Mexico’s landscape which bleed into your very bones, and the artist’s innate passion for music, is that Melander-Dayton has mastered the art of channeling, heart, soul, and a whole lot of psychic energy, into each work that she gives birth to. What better place to store your valuables. In "Rondo" (2010), a work composed of 40 modules of varying sizes, stretching nearly 9 feet across, Melander-Dayton recreates a mountain steam whose crystal clear running waters cover a bed of stones. 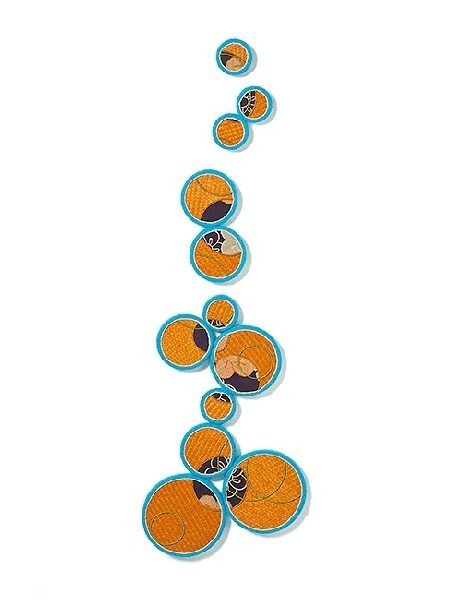 The shimmering stones in this exhibition composed of intensely colored glass beads and lengths of wool, woven onto blue fabric modules and arranged in a horizontal bubble-like flow transform "Rondo" into the musical equivalent of a babbling brook. The work, situated in the corner of the gallery where the two walls meet, an out of the ordinary placement deliberately designed by the artist to split our viewing experience in half, forces our eyes to jump from one wall to the other, effectively evoking thoughts of swift running water. A simpler work, in size and number of units, is "Archipelago" (2010). In eight triangular shaped, sangria bubinga burl veneer gatorboard modules decorated with swatches of silk fabric and strings of wool and beads, the artist revisits Okinawa – a chain of islands off the coast Japan – where she lived for two years during her youth. In "Ryukyu Rain" (2010), one of exhibition’s smaller, statelier works – Ryukyu is also part of a chain of islands in the Western Pacific – Melander-Dayton, decorates four green willow veneer modules – the very largest one being an oval – with her customary silk fabrics, beads, and strands of wool. The overriding color of this work, which is a dry looking tan, actually conjures up the feel of the island’s weather. The air that we sense is hot and humid. 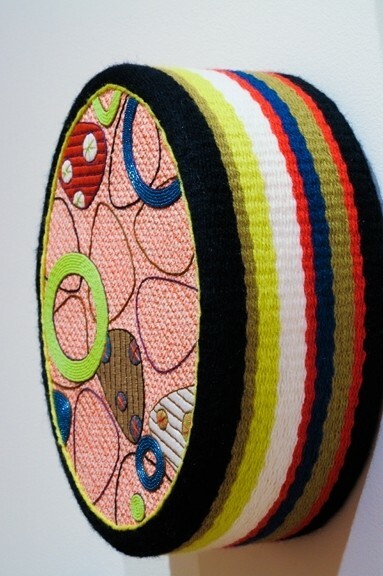 Music, her daily piano playing in particular, in addition to informing her work – like surgeons who have been known to take up knitting– serves to keep the artist’s fingers nimble for weaving, cutting, sewing, embroidering, and working a jigsaw to cut and shape the various veneers that she incorporates into her work. In "Con Brio," another musically inspired work, Melander-Dayton places twelve circular modules in a vertical line. Playfully dancing up the wall, the artist imbues each module with the joyous spirit that the term Con Brio implies. "Allegro Non Troppo" (2008), by virtue of its size, startling mixture of the colors, diverseness of patterning, and sparkling glitter, and "Theme and Variations" (2010) which seems to be signaling yet another new direction for the artist, are the exhibition’s showstoppers. At $25,000 each, they are also commanding the most money. "Allegro Non Troppo," ‘fast but not too fast’ in musical terms, has all the excitement, exuberance and fizz of a champagne toast at a New Year’s Eve party. 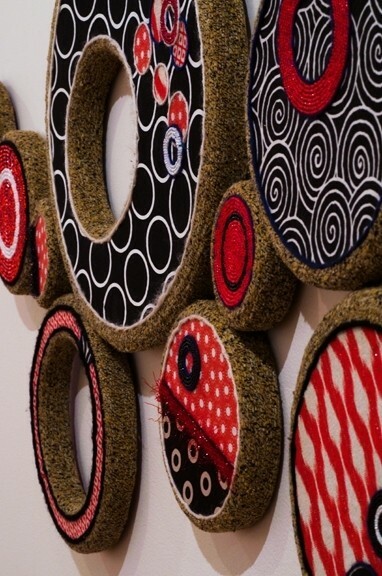 Nearly two feet high, and ten feet in length, the celebratory work sports 42 variously shaped eye-popping, red, black and white circles in over a dozen differing designs. Some are circles within circles that cling to each other. Others stand alone, and all are decorated, each in a different manner, with wool, beads, cotton and Japanese silk fabrics that look like small paintings. The overall effect, as eye-catching as the aurora borealis, is that of fireworks lighting up the sky. "Theme and Variations" (2010) is a whole different kettle of fish. 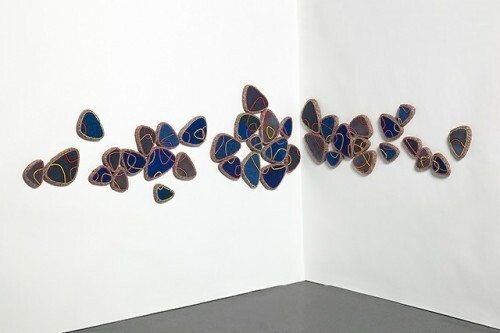 While all of the other works on view are thin enough to underscore the flatness of each module, each of the nine, vertically hung, oval shaped wall sculptures in Theme and Variations, with depths ranging from 2 to 10 inches, jump right off the wall, which leads to a whole different viewing experience. The almost, but not quite, 2-Dimensional components of Melander-Dayton’s other works which allows one to view its many components as a whole, is ditched in this multi-faceted ensemble. Here due to the variance of depth, as well as the unique design of each sculpture – at certain angles the sculptures resembles cakes, at others, sewing kits or small hat boxes – the eye has no one flat surface on which to rest or come to a conclusion. As our eyes are forced to scan each work, up, down, and sideways, our brain is forced look and see, one by one, what it is that we are looking at. It is an exciting situation to be in, as well as a puzzle to be solved. "Great article about a very compelling artist!"